Blizzard Lighting is a small company founded by Will Komassa that used to be a small blip on the DJ, show and event lighting radar that is making in-roads into this very frenzied and unforgiving market. 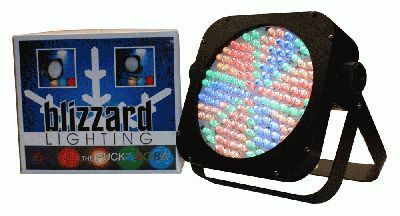 DJzone Labs took the time to review their latest arrival, the RGBA LED Blizzard Puck and came out quite surprised at our findings. At first glimpse, the square flat black puck looked like most all the new generation LED Par fixtures out there. It is about nine inches square and 4 inches thick on the one side. Flipping it over, it has an inset area for plugging in the AC power and an area for adjusting the settings. The yoke on the light doubles as a way to hang it and a floor/table stand for uplighting. The settings are quite straight forward and easy to use. Mastering them took only about 10 minutes and we were mixing just about any color we could think of. The RGBA stands for Red, Green, Blue and Amber and this turns loose a whole new pallet of color for the light specialist or decorator to use. Before you only had red, green and blue which gave you a very cool (as in cold) spectrum to work with. If you had an event and wanted to create anything with a yellow, amber, or orange, it was doable but difficult and the results were acceptable, but not spectacular., claims Taylor Jeffries, lighting design specialist. The amber gives everything you do a warm rich look. In todays design and event arena, purple, orange, amber and the new top color for 2011, honeysuckle pink, are next to impossible to recreate using just RGB. With the Blizzard RGBA puck, the amber element makes your purples look deeper, your oranges really pop, and yes, with a little work, you can create a very realistic honeysuckle pink for that persnickety bride. With a two year warranty the Blizzard RGBA Puck all in all is a real cool (as in cool) light at a price point that is set so most budgets can afford to get a little A (as in amber).